Finding the right work boot can be difficult given the number of options available. More recently, we have seen the Columbia Newton Ridge Plus II rise in popularity among shoppers. These boots have some key features and qualities that help them stand out from the competition. Today, we will examine this product by highlighting its features, uses, and purposes. Additionally, we will recommend situations where these boots would be most beneficial as well as some situations you may want to avoid. The leather structure of the Columbia Newton Ridge Plus II creates a premium outdoor feel for users. This boot is supportive and waterproof and works well to keep feet dry while allowing them to breathe. These work boots contain a five-inch shaft that provides excellent ankle support to get you through the day. These work boots contain an Omni grip rubber outsole. This outsole features rugged traction that provides gripping traction specially designed for use in muddy conditions. This feature ensures users are able to keep their footing in some of the toughest conditions. Additionally, there is a shank under the arch which provides ample stability and support as well as the freedom of flexibility where you need it. In addition to being fully supportive, these work boots are designed to provide lasting comfort. The midsole contains Techlite cushioning, there is a padded tongue and collar, and extremely breathable mesh. These boots provide excellent waterproofing in wet and muddy conditions. Users highly appreciate the comfort and the extent of arch support provided. The boots are very easy to clean and can air dry rather quickly. One excellent characteristic about the Newton Ridge Plus II by Columbia is that they are truly sized-to-fit. Individuals are able to purchase these boots in the size shoe they wear and have no issues with fitting them properly. The Newton Ridge Plus II boots work very well for keeping your feet warm and dry. Users opt for these boots when working or being out in cold and snowy conditions as they find them to be extremely reliable for keeping the feet warm and dry. 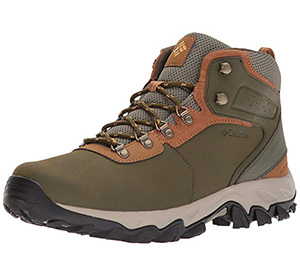 These are great boots to wear while working or hiking. These boots are an excellent option for automotive workers. They require endless comfort and flexibility, both of which these provide. These boots are great for individuals that spend hours on their feet. The Newton Ridge Plus II boots work well for individuals in muddy or wet conditions. These are great for working outdoors and on uneven grounds. The Newton Ridge Plus II boots work extremely well to keep feet dry and warm. Plowers and individuals that work outdoors in the winter truly benefit from using these boots. These boots do not have a steel toe, so they are not a good option for individuals lifting heavy items. These boots are not a good option for workers that use heavy equipment all day. Machine or factory workers may want to avoid these boots. There is no steel toe or over-emphasize toe protection, so your feet may be vulnerable to overhead drops. A lot of users opt for the Newton Ridge Plus II boots due to their weatherproofing characteristics. Individuals hiking or working in cold and wet conditions truly appreciate the protection these boots provide. One user wore these outdoors in Iceland where the weather is extreme and had no problems whatsoever. Users are able to wear two pairs of socks or thick heavy wool socks and still remain comfortable in the boots. Individuals that work all day on their feet find that Newton Ridge Plus II boots are a perfect choice. These boots are lightweight and extremely comfortable to wear. One user reports having to wear them 10+ hours a day while on his feet and he finds them to be extremely comfortable all day long. These boots are very easy to clean. It takes a quick wipe down with a damp cloth to have them looking good as new. Users found that salt and other outdoor elements were no match for these boots. The traction on these boots is also something customers truly appreciate. They are able to push through and grip nearly any surface, whether it is wet or dry, and they are very stable to use. When selecting the ideal work boot, it is important to select one that protects you right where you need it. If you are going to be on your feet all day, it is important to select a boot that fits comfortably no matter what type of socks you want to use. Make sure you are able to easily put the boots on and remove them and the boots have ample flex at the ball of your feet. Wearing tight boots from the beginning will restrict blood flow to your feet and cause pain after long days, which is something you want to avoid. When laced, boots should be comfortable yet snug enough to keep them in place throughout the day. During the day, your feet will swell — especially if they are hot. Overall, the Columbia Newton Ridge Plus II seems to be an excellent option for workers and hikers alike. These boots are comfortable, supportive, and have excellent gripping for any surface. These are a great choice for workers indoors and outdoors and they stand up extremely well in cold and wet conditions.